Here are the Arkansas Ozark Mountains as you've never seen before. 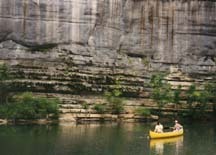 The Ozarks highest river bluffs, as tall as 440 feet, consist of sandstone, limestone, and dolomite. Towering over the Buffalo National River, these multi-colored cliffs have been sculpted over the centuries by erosion. Today they sharply accent the river and its surrounding wild mountain beauty. The park's geology, with its numerous caves, cliffs, sinkholes, waterfalls, springs, and interesting rock formations, typifies the Arkansas Ozarks. Naturalist programs at Buffalo Point, Tyler Bend, Pruitt, Ozark, and other locations in spring, summer, and fall include campfire programs, guided walks and hikes, guided canoe floats, and Ozark craft and folk music. Check with the park's visitor center and ranger stations for weekly schedules. River guides, topographic maps, and books exploring the region's natural and cultural history are sold at the visitor center, ranger station and at park headquarters in Harrison. The Arkansas Geological Survey has a geo-float guide online. Few experiences can compare to a float trip down the Buffalo. Clean waters, high bluffs, wooded hillsides, and a myriad of seasonal wildflowers conspire to turn staunch city lovers into nature enthusiasts. Inexperienced beginners can float slow-moving river sections and canoes may be rented nearby. Between Carver and Woolum, and downstream of Rush, the river offers a near-wilderness experience. Choices for length of float trips also abound. You can make half-day floats; a 10 day and 120-mile expedition, or anything in between. You can even enjoy time in an inner tube at the Buffalo Point gravel bar. The ghost town of Rush, once a thriving zinc mining community, now stands a silent reminder to the people and industry which existed in this valley of the Buffalo River. Unbelievably, the now abandoned town of Rush was once the largest community in Marion County. Only a few traces seen on nearby nature trails remain as testimony of the mining activity from the late 1800's to the early 1900's. Have photos you would like to share? Please send them to us!